Little is known about the Polacanthus due to the fact that there have only been around three partial fossils founds. But there has been hundreds of armored plates founds for this dinosaur. These plates were on its back and possibly used for defense against the large carnivores of the Cretaceous period. 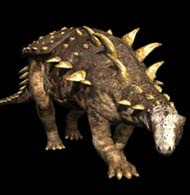 What we do know is a little common information such as the Polacanthus was an herbivore, is in the ankylosaur group, a heavy amount of armored plates and spikes along its body. The first specie of Polacanthus was found in England at the Isle of Wight by William Fox in 1965. This was not a full body of the dinosaur fossil finding. It was a partial with much missing making it very incomplete. Much later, a second finding was by Dr. William T. Blows in 1979. This was the first specimen to show anterior armor and neck vertebrae.